…“In what has been a challenging year for the Australian economy and the aviation industry in particular it is pleasing to see that our airports at Gold Coast and Mount Isa have achieved greater than 8.5% growth,” said Dennis Chant, Managing Director of QAL. “Townsville Airport however, experienced a 2% reduction. We attribute this to a slowdown in the resources sector and cost reduction initiatives at the state and federal government level. This entry was posted in Gold Coast, Tourism, Townsville and tagged gc, gcairport, goldcoast, goldcoastairport, qld, queensland, queenslandairports, townsville, townsvilleairport. Bookmark the permalink. 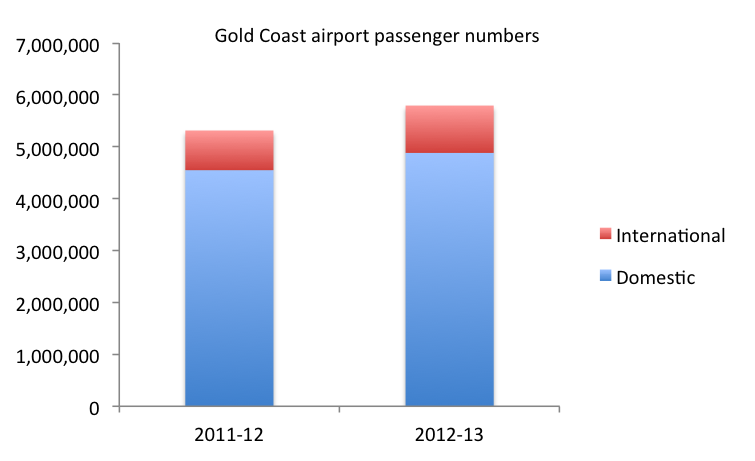 Have you considered the increase in Gold Coast airport numbers being a consequence of the delays caused by poor management and lack of planning for growth at Brisbane airport. Due to recent detrimental publicity I am sure a lot of passengers would be avoiding arrivals at Brisbane. That’s a good point. It certainly could have an impact. Thanks.